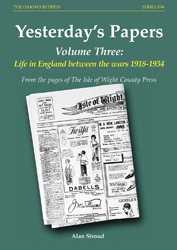 The County Press has been reporting the highs and lows of island life for nearly 125 years and during that time well over 6,000 weekly editions have been produced. Happily, a copy of every issue has been preserved for posterity and now sit, bound in large volumes, in a strongroom in the County Press offices, available today through the more accessible means of microfilm. The archive is a vast and largely unmined repository of stories and reports of every aspect of island life recorded with a thoroughness that only local newspapers can afford. It is a fascinating assortment of minutiae that conventional history sources cannot begin to compare with and is probably unmatched as a local history source. Like the previous volumes in this series this is a dip into that archive, this time for the years 1918 to 1934, to give a view of events and attitudes of those times from a contemporary perspective. It would be unrealistic to suggest that a small book of brief extracts can give a definitive account of how life was all those years ago. To fit 16 years into just over 200 pages and provide a rounded portrait of such a large period is a tall order, but hopefully this selection has captured some of the flavour of everyday life in the 1920s and 1930s. While the owners of some provincial newspapers regarded their publications as a personal mouthpiece, the brief for the County Press was only ever to provide an impartial account of island news every seven days. If they ever did have thoughts on the stories they reported, they kept them firmly to themselves and virtually nowhere in the local pages do politics or opinions ever intrude. Only in the reporting of national events did the County Press allow itself the privilege of speaking its mind. Without exception the articles are well written and easily stand the test of time. The are written in a confident and commanding style not unlike today’s broadsheets, and as for being well-informed, they have the matchless virtue of being a contemporary voice. A5 format, 224 pages, 63 illustrations.